Leading Exporter of fully automatic color paver block machine, concrete paver block machine, chirag automatic concrete color paver block machine, chirag semi automatic color paver block machine, chirag multifunction color paver block machine and chirag multi material color paver block machine from Coimbatore. Ø Compact design and Automatic control, with easy operation. Low investment brings you cost saving.Ø Highly productive moulding device, which consists 360 rotating and compulsory feeding of raw materials, platform vibrating and compression shaping, greatly improves the cycle time. The finished blocks are of good shape and high quality.Ø Our machines, with harmonic cooperation between mechanical, electrical and hydraulic machines functions, guarantees a reliable and high production output of concrete products.Ø The moulds are changeable, and it is able to produce various kind of blocks,bricks,interlocks, pavers and kerbstones in different types, sizes, shapes, and colour layers.Ø With face mix device, its able to produce pavers with colour layer. 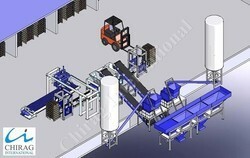 Compact design and semi-automatic control, with easy operation. Low investment brings you cost saving. Chirag Automatic Concrete Color Paver Block Machine Our machines, with harmonic cooperation between mechanical, electrical and hydraulic machines functions, guarantees a reliable and high production output of concrete products. Chirag Semi Automatic Color Paver Block Machine Highly productive moulding device, which consists 360 rotating and compulsory feeding of raw materials, platform vibrating and compression shaping, greatly improves the cycle time. The finished blocks are of good shape and high quality. Chirag Semi Automatic Color Paver Block Machine The moulds are changeable, and it is able to produce various kind of blocks,bricks,interlocks, pavers and kerbstones in different types, sizes, shapes, and colour layers. Chirag Multifunction Color Paver Block Machine Our machines, with harmonic cooperation between mechanical, electrical and hydraulic machines functions, guarantees a reliable and high production output of concrete products. Chirag Multifunction Color Paver Block Machine With face mix device, its able to produce pavers with colour layer. Chirag Multi Material Color Paver Block Machine Highly productive moulding device, which consists 360 rotating and compulsory feeding of raw materials, platform vibrating and compression shaping, greatly improves the cycle time. The finished blocks are of good shape and high quality. Chirag Multi Material Color Paver Block Machine The moulds are changeable, and it is able to produce various kind of blocks,bricks,interlocks, pavers and kerbstones in different types, sizes, shapes, and colour layers. Chirag Brand New Color Paver Block Machine Highly productive moulding device, which consists 360 rotating and compulsory feeding of raw materials, platform vibrating and compression shaping, greatly improves the cycle time. The finished blocks are of good shape and high quality. Chirag Brand New Color Paver Block Machine The moulds are changeable, and it is able to produce various kind of blocks,bricks,interlocks, pavers and kerbstones in different types, sizes, shapes, and colour layers. Chirag Multi-Production Color Paver Block Machine Target User: requires high production output of concrete blocks, in different types, sizes, shapes and colours. Chirag Multi-Production Color Paver Block Machine Applied Products: concrete blocks, solid/hollow/cellular masonry products, paving stones with or without face mix, garden and landscaping products, slabs, edges, curb stones, grass blocks, slope blocks, interlocks etc Chirag Multi-Production Color Paver Block Machine Applied Fields: widely used in buildings, road paving, squares, gardens, landscaping, city constructions, etc Chirag Multi-Production Color Paver Block Machine Raw Materials: crushed stone, sand, cement, lime, flyash, cinder, slag, gangue, gravel, perlite, and other industrial wastes. Looking for “Fully Automatic Color Paver Block Machine”?